Google Chrome has no doubt become a great and preferable browser for us, but what increases its work efficiency is the abundant supply of extensions which when installed lifts your chrome to a higher level. But since there are a huge number of Google chrome extensions, so choosing the best chrome extensions is somewhat difficult from the Chrome Webstore. But to make that job easy, I have formed a list of great extensions that you can add to your Google chrome and make your working experience better than before. You can find links to them below each mentioned extension, and their details. Evernote for chrome is one of the best and unique bookmarking extensions that you can add to your chrome. You can save all your notes, webpages you like, your to-do lists and so much more with this great extension, and all that you store is on the cloud, so you will be able to access them anywhere and anytime. Just save your favourite site or snapshots using Evernote, and carry them wherever you go. 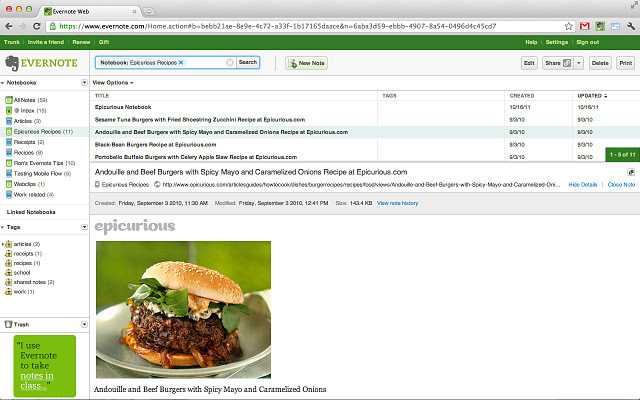 As you can see above, the Evernote interface is great, easy and simple to use, yet so much powerful. Hootsuite is a great extension for managing all your social media campaigns at once using the powerful interface of Hootsuite. Spread your messages in your Twitter, Facebook, Foursquare and many more services without having to navigate to each pages for doing so. Apart from that you can also use this tool to track your campaigns. For example if you have made a tweet using Hootsuite, you can see how much impact that tweet makes on your audience, by seeing the number of clicks on the short url made for your links automatically by Hootsuite, see the trending topics and much more. This is the best extension to manage your social media campaigns using Google chrome. Read Later Fast is another useful Google chrome plugin which will help your browse better and faster. Suppose you are having a number of opened tabs on your browser, which is affecting your browsing performance, in that case this extension is perfect for you. 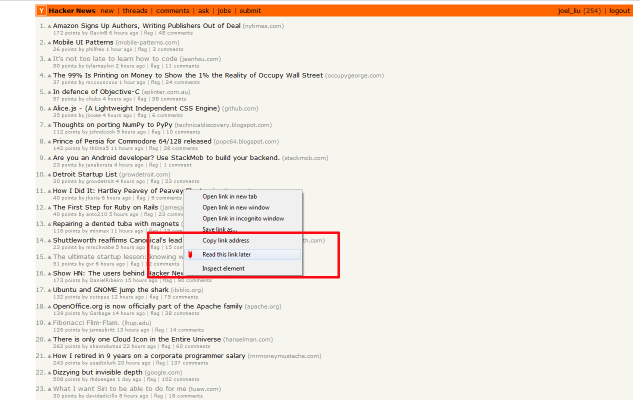 With this extension you can choose to save pages that you will read later on, by right clicking on the page or link, and choosing to read it later. As you choose to read later, it will be saved in your read later fast account, and you can easily access all the pages you have chose to read later directly from your chrome browser, making it easy and convenient for your explore the internet, while having no bad effects in your surfing experience. 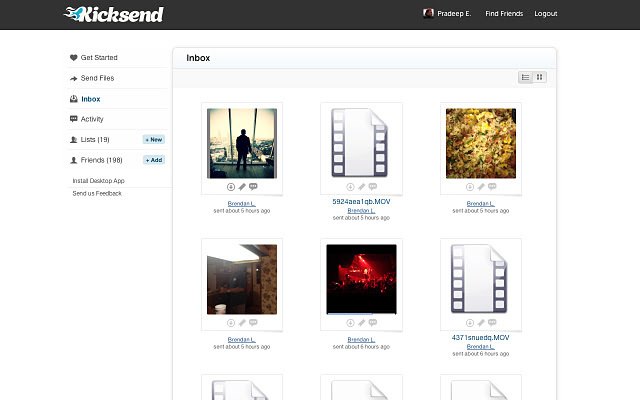 Kicksend is like file mailing service which you can use directly from your chrome browser using this extension. You can easily mail a file to your friends or anyone else, secure, fast and private. You will also have an inbox to receive all the files, your friends send you. This eliminates the need to uploading your files at a file hosting service, and then emailing the link to the file, as you can directly send your files using this service, and this plugin makes that task even easier by integrating Kicksend to your chrome browser. If you send a lot of files, then this extension is surely for you, because this service makes it real easy for you to manage your files, exchange them within your friends, easier than any other service available. 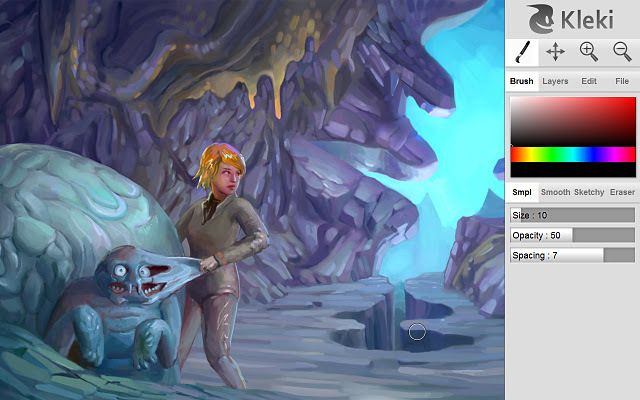 Kleki is a great painting tool for Google chrome that will help you draw better right from your browser. You can use this tool to unleash your creativity, using the advanced drawing options that are available in this tool for you to draw better and more efficiently. You can also edit your photos using this tool, right within your browser, thus making your browser a drawing tool for you. This is one of the best drawing and image editing tools available for your Google chrome browser. Add Google+ to your chrome to easily +1 any page you browse. With this great and official chrome plugin you won’t have to separately visit your Google+ profile to share the page you are viewing, just use the +1 Icon located at the right side of the address bar in your chrome and share it with your friends. 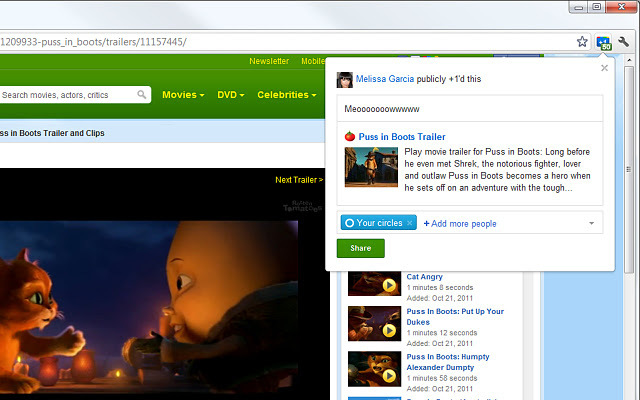 As you can see above, this extension not only just makes a +1 to the page, but also gives you advanced sharing options. 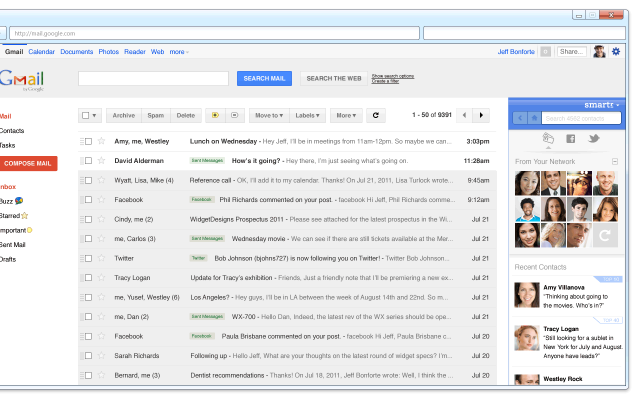 This plugin for your chrome will make your chrome even better for using Gmail. This extension will automatically fetch all the contact information, profile pics of people you have interacted with, when they send you a mail to your Gmail account. Its also very relevant, as it knows which people are more important to you, and will suggest their email addresses when you are sending a mail. It will also display their latest updates from different social networking sites like Facebook and Twitter, to help you keep in touch with them. This is a cool and handy extension for your chrome browser, which allows you to type in your favourite language anywhere and anytime. With this extension you will be having virtual keyboards for about 70 languages which makes it easy to type in any language you want. For example, if you are typing an email in Chinese, then you can easily use the virtual keyboard for Chinese language and type your message. This is a very useful tool if you have to communicate in multiple languages. 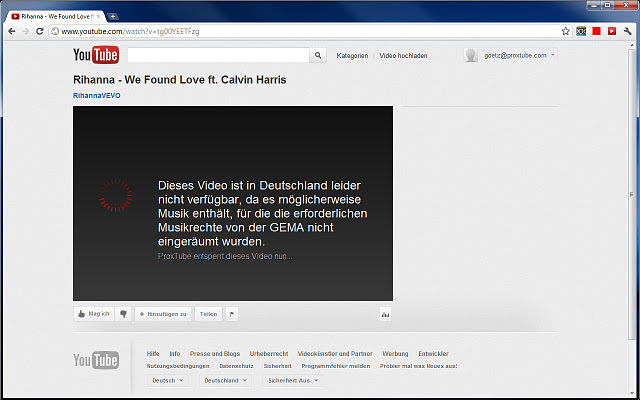 This is handy tool for your chrome browser if you are having problems in viewing region specific videos on YouTube. With this extension you can easily unblock any video which you were having problem in viewing due to the country specific rules of YouTube. This tool uses an American proxy to view those videos, and it takes only one click to do so. This extension will help you viewing pics shared in Facebook, easily and attractively by using the inbuilt photo zoom feature in this extension. 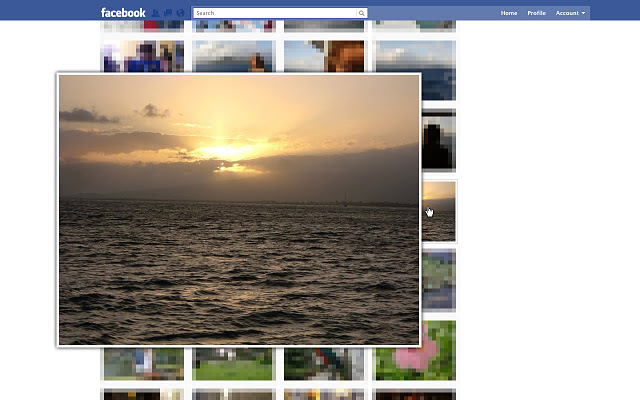 When viewing any image in Facebook, just hover over it, and it will be automatically zoomed for you, as illustrated in the picture above. This can be a very useful tool for you, if you use Facebook. These Google chrome extensions will help your work better using your chrome browser. But still if you have any problem with these extensions then feel free to ask me, and I will be replying to your queries as soon as possible. So what are you waiting for, start adding these cool extensions to your chrome browser and enjoy the great features that these extensions has to offer. You can also suggest any other chrome extension that you may know and which can be helpful to work better, so that next time when I compile this kind of list, I can add your suggested extension there. So which one have you chosen to as the best for your work? Author bio: This post has been written by Rahul Chowdhury, who invites you to check daPazze, which is a blog based on Blogging, SEO, Social Media and Technology. He has also compiled several lists there that will help you make your Google Chrome better. i will add those extensions in my avant browser and chrome . 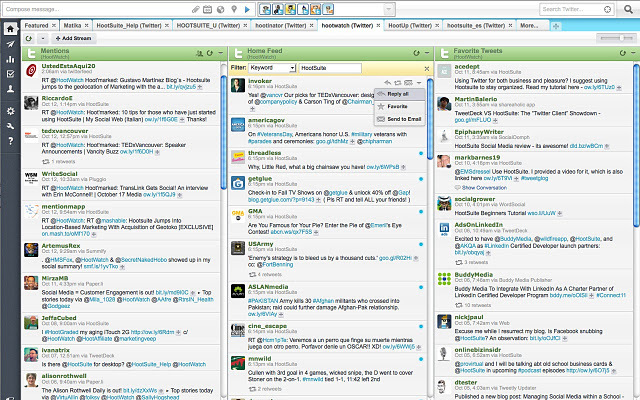 These extensions look cool, but I use firefox when it comes to enhanced browsing. 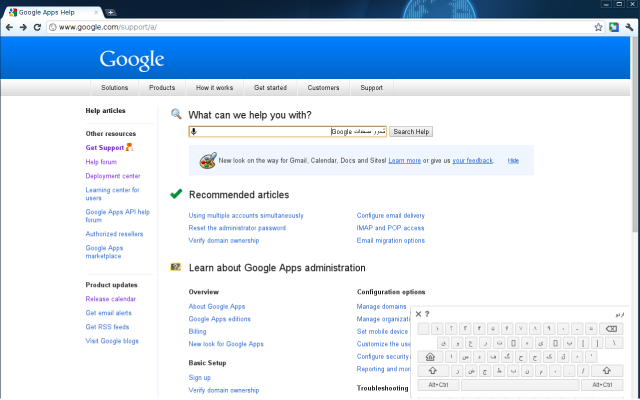 Yes the addons make it slow but where would you go if u want advanced browsing options. I’d use Google Chrome more often if it didn’t constantly cr** out on me. But those tools sound great if I could get the browser to work.